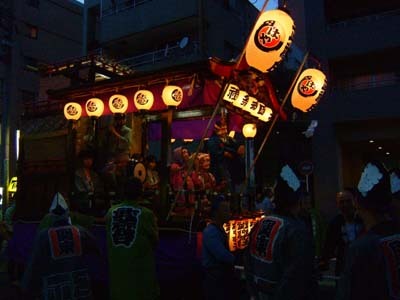 Highlights of the Kurayami matsuri. 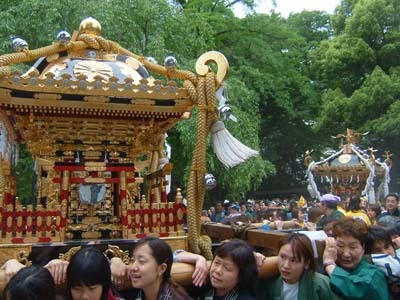 All eight portable shrines are carried out, get cleaned. Changing stay bars to shouldering bars, and fastening decorative ropes. 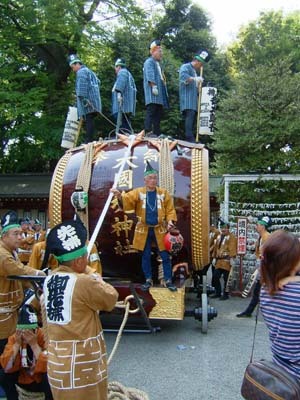 At the same time, large festival drums are loaded on each carriage. 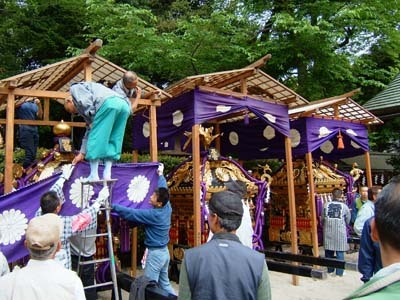 This is not an festival program, instead a good opportunity to take a close look at Omikoshi. 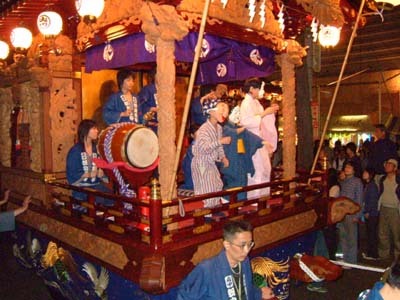 Floats gather in Keyaki-namiki, and people play Ohayashi (kind of festival music with dance) They perform until Koma-kurabe, and have a break during the race. 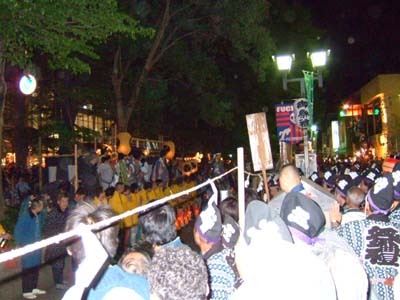 Then they proceed with their performance, and parade back to their own residential block. 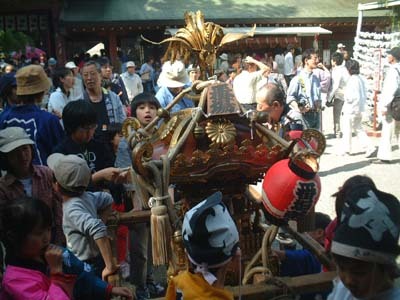 Four horses race to Ohkunitama shrine. 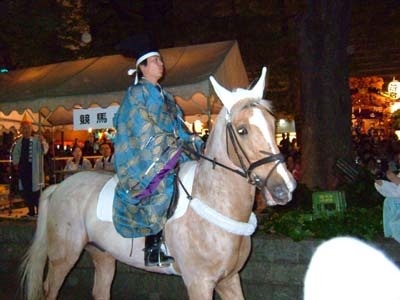 Horsemen are in traditional costume. 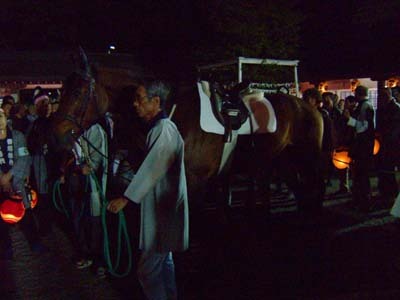 Those horses are from Shi-ka-cho(four main parishes) each. Youth bloc in residential blocks make one Hana-Mando (picture above) each for the day. They show off their works and get judged for artistry, gorgeousness, and fineness. 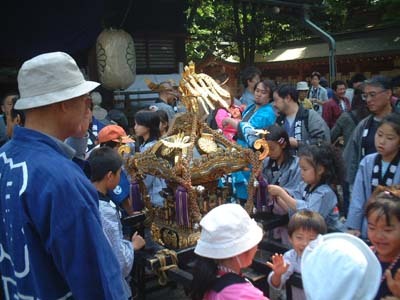 You can see Kodomo-Mikoshi(little portable shrines for children) are also brought with Hana-Mando for purification. Though small, many are sophisticated and crafted fine. 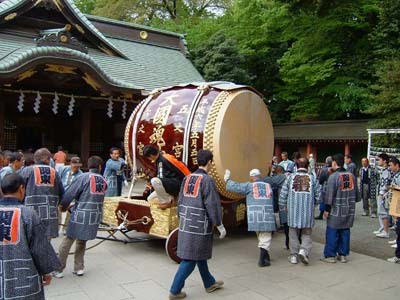 Large Japanese drums go round shrine parish. 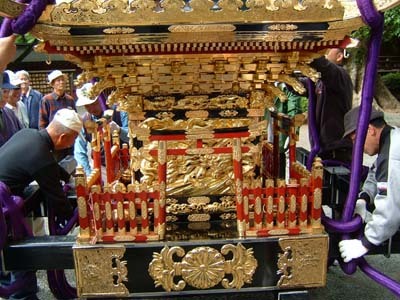 They are usually displayed in Houmotsu-den (treasure house). 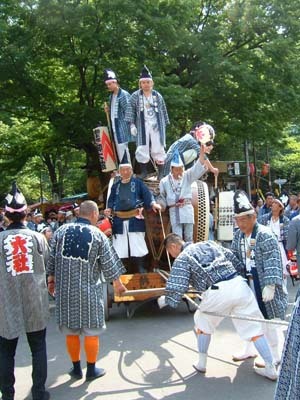 During the Kurayami Matsuri, the drums come to public and tour around. 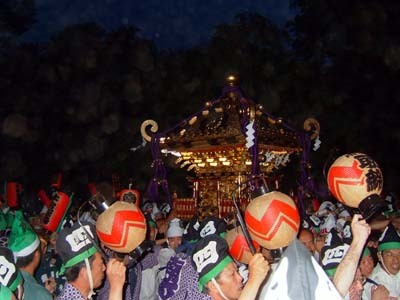 Around from 5 o'clock p.m. to 6 o'clock p.m. you will see some drums at the O-torii(big guard frame, shrine gate) of Ohkunitama shrine. 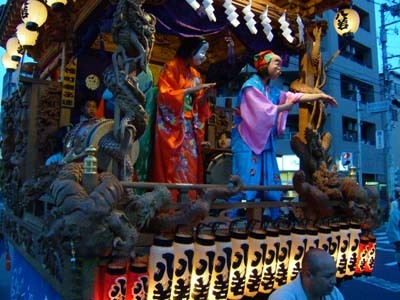 Note: Float parade marches by at the same time, it will be very crowded. 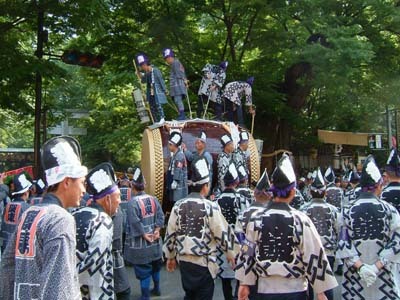 Whole floats in Fuchu city gather to parade in combination. 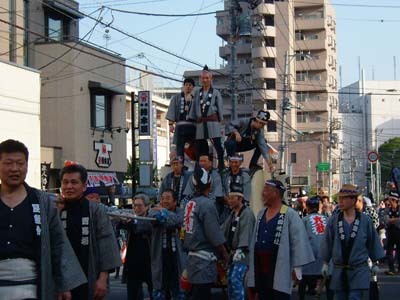 Joined by those which can not come for Ohayashi performance the day before becouse of long distance, the parade makes boisterous. They rearrange the parade route occasionally. 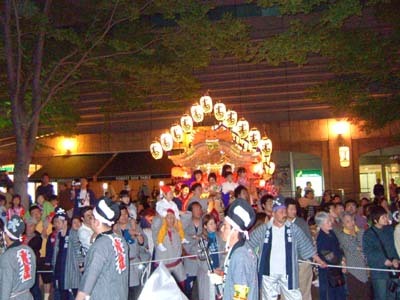 Ohkunitama shrine is one of good spots to watch the parade. 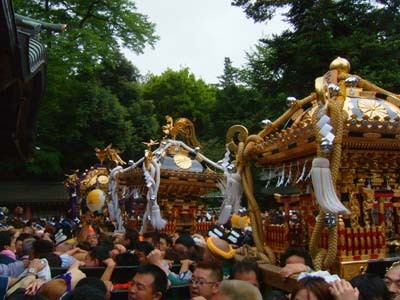 The floats are supposed to pass by the shrine wthout fail. 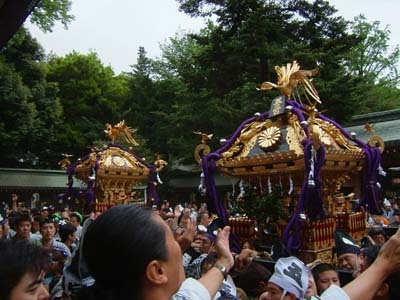 The drums are all hauled to the shrine precincts. 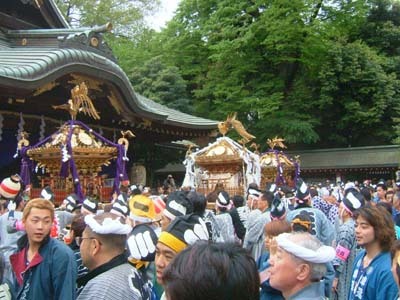 Osakibarai-drum and Goryogu-drum are carried in Chujaku-mon gate, which is second nearest to the inner shrine. 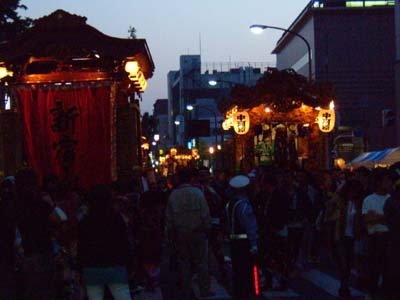 And the others are set between Chujaku-mon gate and Zuijin-mon gate, the third nearest gate. 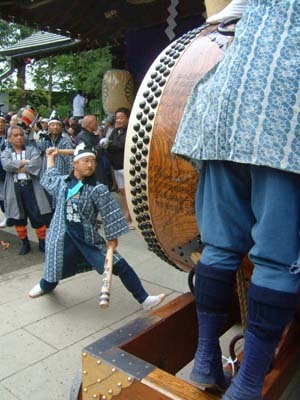 People sound drums hard and heavily to proclaim the deities' coming until onset of the rite. 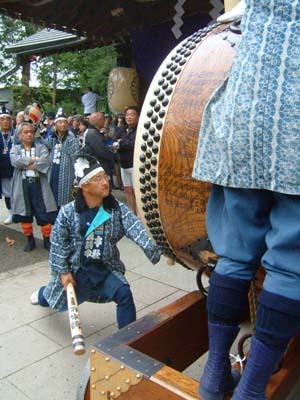 With shooting off of fireworks, six drums begin their thunders again. 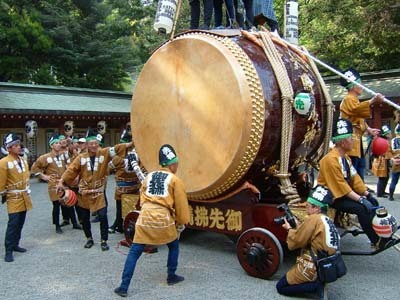 And eight Omikoshis (portable shrines) come from the shrine to Otabisho (the ceremonial precinct) led by the drums. 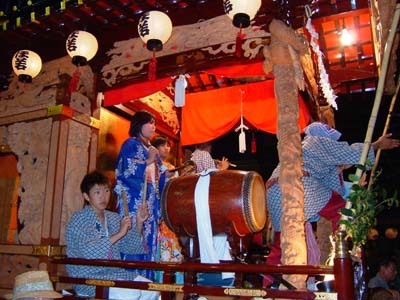 There are two ways for Omikoshi going. 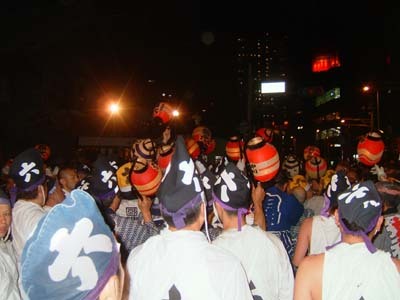 Seven Omikoshis go under O-torii (shrine main gate) for Kyu-Koshu-Kaido (Kyu-koshu road). 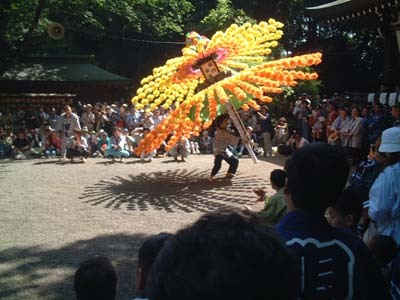 In the meanwhile one omikoshi Goryou-gu turn around in front of the main gete and pass under Rokusho-guchi, the west gate. 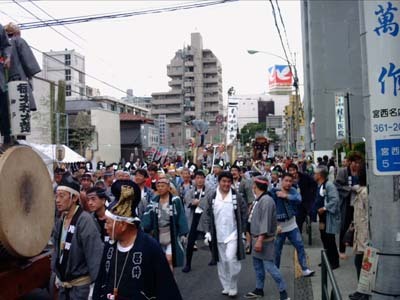 It goes by Fuchu-kaido (Fuchu road) to the precinct. At 4 o'clock a.m. fireworks burst. 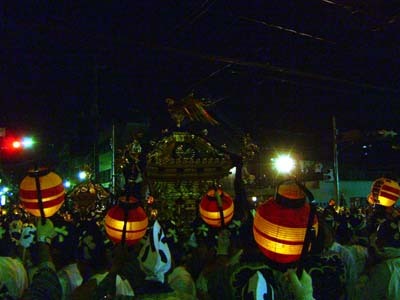 Eight Omikoshis, finished every ritual ceremony in previous night, leave Otabisho (sanctuary). 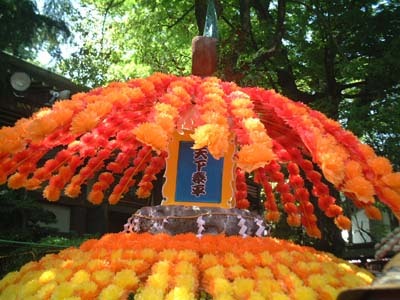 Omikoshis go round shrine parish. 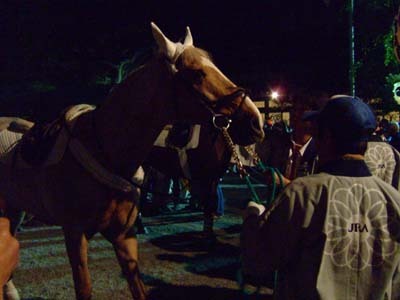 After the tour, they come back and return in Ohkunitama shrine at about 7 o'clock. 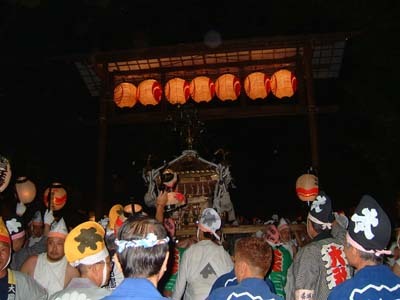 At the final moment within Chujaku-mon gate, people under Omikoshis raise their call out and waggle up and down their own Omikoshi. It is an exciting sight but better to keep a distance from being sucked in the mess.